The wind had changed by mid-August, and after my Portland explorations had come to a close, I made my way south, this time by way of ride share. And little did I know of the vibrant sights and melodies that awaited me. After briefly jumping off of the freeway and saying goodbye to my ride share partner (whom I consider another craigslist success), I set foot in Ashland, Oregon; and now that I see the whole journey in retrospect, I often suspect if it was all according to some higher plan that I unconsciously decided to step into, because as it turned out, Ashland fit into my journey just as effortlessly as magnets snap together. 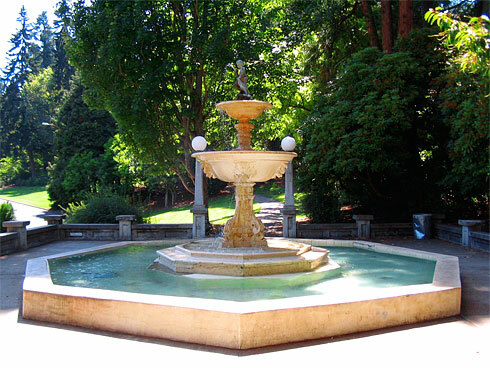 And while I was catching up with some relatives, I learned about Lithia Park, a park that I would soon discover was a centerpiece of the city itself, a centerpiece that I would soon learn might just as well be called the Jewel of Southern Oregon. 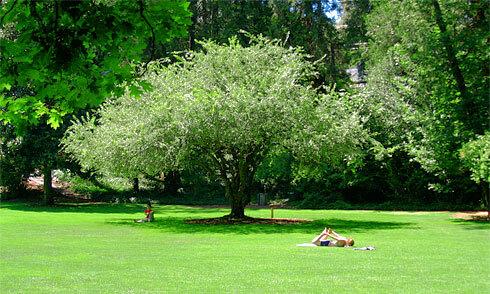 Even the walk to Lithia Park was overflowing with green, radiant life. Apparently, late summer is the perfect time to photograph plants in Ashland, because everything seemed to be in bloom. It was the perfect time to explore Ashland on foot. 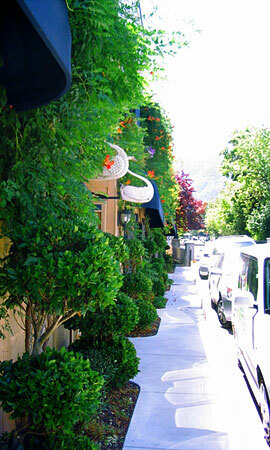 In fact, I was shocked to see how cultivated some of the streets were. As you can see from the photo to the right, you can’t walk down the street in Ashland in the summer without feeling close to nature. Not unlike Madison in Wisconsin, Ashland is what I would call “cozy-sized”, meaning it’s somewhere between the size of a sprawling metropolis (like Chicago or New York) and a small town. Cozy-sized cities are usually diverse enough to have lots of places to explore, but are small enough to make it pretty easy to walk anywhere within the city. 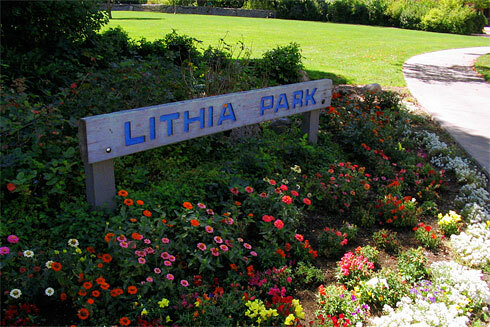 And it didn’t take long to reach the entrance to Lithia Park which was marked by a sign with dozens of bright flowers growing below it. Nearby was a plaque with a map on it, and in the distance I heard faint music. What makes for a Richer Experience? The point being, they didn’t just hire Bob Joe Landscaping, Inc. to design the park. Far from it, Ashland’s Park Commission recruited some of the very best talent to design what has become a treasure trove of biodiversity in the area. Smart move, Ashland. After passing the Meyer Memorial Lake, I discovered the source of the beautiful music I’d heard before. To the side of the main path, sitting under a million verdant leaves, was a man playing an exquisitely-crafted cello. Just as the jazz concert had made exploring the International Rose Test Gardens an even richer experience, the presence of his music made appreciating the natural wonders of the park even more enjoyable. After taking a couple minutes to capture that moment with my camera, I gave him some encouraging words and continued down the path. And so, I began wandering though the park. I soon realized that you couldn’t throw a stick without hitting 17 different types of trees all beside one another, each having a numbered sign below them explaining exactly what they were and what made them unique. From the towering Black Oaks to Ponderosa Pines, this park had an impressive level of diversity for belonging to a city of less than 25,000 people. Under one red oak, a man dressed in red rested in the shade. Nearby, a woman did what looked like yoga under the warm sun. The air was sweet, the temperature was perfect, and the sky was singing. Everywhere I looked, there seemed to be some kind of tree or shrub that I’d never seen before, not that I’d necessarily have a reason to before that moment. After all, I’m no botanist. 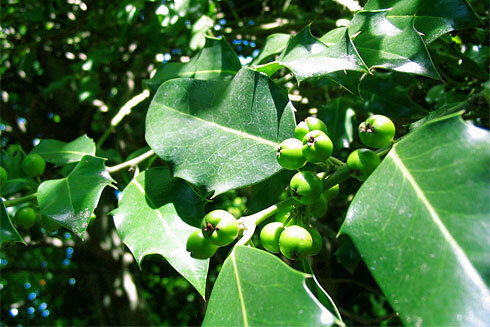 The English Holly tree (pictured above) stood out to me though. It had vibrant little green berries which were almost certainly poisonous to humans. There was also a purple-leaved plum tree whose leaves were maroon even though it wasn’t autumn, and an amusingly-named “Vanhoutte Spiraea” hybrid shrub. Vanhoutte? Really? Like Karl Van Houtte? Then again, considering “van hout” means “wood” in Dutch, perhaps they were simply at a loss for what to name a mere tree. A few minutes later, I came across an interesting piece of what I’ll call art (though you may disagree with me) scrawled onto a nearby shaded seating area. It consisted one arrow pointing up, conveniently marked as “down”, and one arrow pointing down, marked as “up”; and the words “time to rethink” were written between the two arrows. Now, I usually find graffiti to be an eyesore and thoroughly annoying, but this one was different. I liked how its white ink complemented its surroundings, but I liked how it challenged my perspective even more. Who was I to say which way was truly up or truly down? After all, there is no up or down in space, and aren’t you (and everyone else) hurtling through space as you read this? Near to this unusually thought-provoking piece of art was a small Japanese Garden that was nestled within Lithia Park, and even though it wasn’t nearly as large as the Lan Su Garden in Portland, it was a good size relative to the rest of the park. Sure, it didn’t have the range of species and architecture that the Lan Su Garden in Portland had, but it didn’t have the space for all of that, either. And let’s not forget, unlike the Lan Su Garden, this garden relies entirely on public funding, which also allows it to be available to the public free of charge. 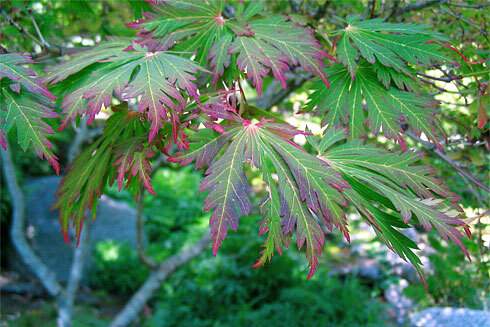 Considering those circumstances, it was done quite well; and, after being foiled by a small bird who refused to be photographed, I came across a lovely Fullmoon Maple tree (pictured above) which stood out to me as one of the more beautiful and colorful specimens of Japanese horticulture in the garden. See how the leaves turn reddish on the edges? That coloring is normal for the summer, so just imagine how it must look in autumn! On my way out, I noticed that, although over an hour had gone by, the man playing the cello was still hard at work, and I hoped that he had gotten more tips in the time I’d been exploring this jewel of southern Oregon. Clearly, I’d just seen the most beautiful part of the city, but on my way back to my cousin’s place, I noticed something that nudged me to use my camera one last time before leaving Ashland and continuing on to the Golden State. As I was walking back, I noticed a path leading under a bridge. At the head of the path was a sign that read “The Path to Joy and Unity”, and beyond it I could see paintings on the ceiling of the bridge. I couldn’t resist. I followed the path and discovered some great paintings on display, including a huge montage of Emperor penguins and Polar bears playing in a snowy landscape. I realized this was an outdoor gallery of sorts, and I continued to follow the path which led me out from under the bridge and back into daylight. 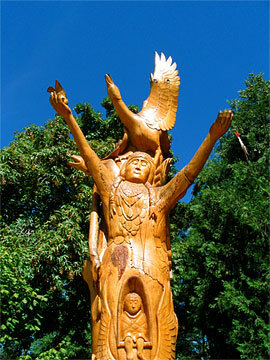 At the end of the path was a huge wooden statue that reminded me of a totem pole (pictured to the right). As you can see, the statue was pretty epic, and it was an excellent way to finish off my explorations of Ashland. If you’re visiting Ashland or even if you’re just passing through, I highly recommend taking some time to visit Lithia Park. It’s beautiful, it’s family-friendly (there’s even a fantastic children’s play area), and it’s free. Whether you stop to snack in the shade of a Red Oak, stretch beside a spiraea shrub, or sit in silence, I can’t think of a better place in the area to sit down and reconnect with nature. After all, where else in Oregon can you see this much biodiversity, have your perspective challenged by graffiti, and possibly even hear Bach cello suites being played in the distance? And if you’re really brave, don’t just sit in the shade or walk around. Instead, why not hang upside down on one of the trees? 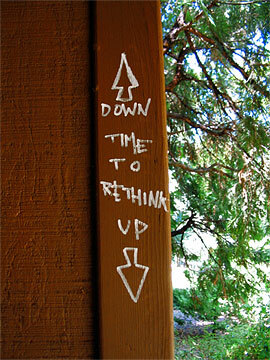 After all, isn’t it time we rethink what’s up and what’s down? All photos from this event are in the Lithia Park gallery. Nice pictures. I also love how maple trees look in the fall. They turn such a nice red color. Cool nature trip! 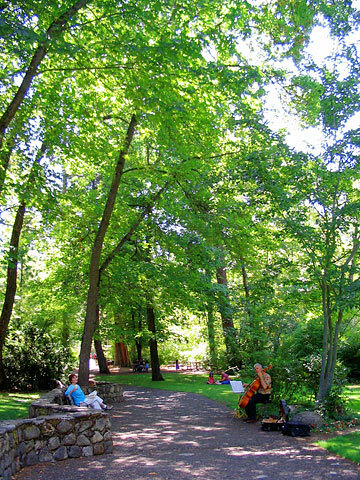 I can almost feel the relaxing ambient while sitting under the Ashland Park trees and listening to the music of the talented musicians. The place would be a wonderful haven for stressed out people like me. Sigh. I wonder when can I visit it. Glorious nature at its best. Places like these are truly God’s Blessing.